I'm brand new to this site and digital drawing. I've downloaded some brush presets and tutorials, and I need to know where to go from here. 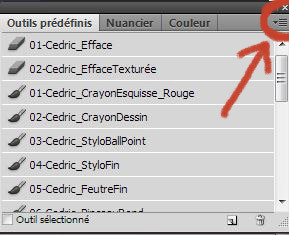 I have Photoshop CC and I'm trying to upload the presets so I can follow the tutorial, but I'm assuming I need to add them to a folder, that I can find, so that Photoshop will open with the new brushes. Please help this noob so I can finally start my digital drawing journey. Then click on the Tool Preset option in the menu. It should open a tab like this one. This is where you'll be able to select your tool presets once you've upload them. If you never used it, then yours might be empty or might have some default presets, I don't remember how it normally looks like. Then on the far right click on the little icon with the small arrow and four lines. It will open another menu, where you can then chose the ''Load Tool Presets'' option (or something along those lines) It will open a new window where you can basically select from your computer the presets files you want to upload . So you can save all of your presets in the same folder for easier access.